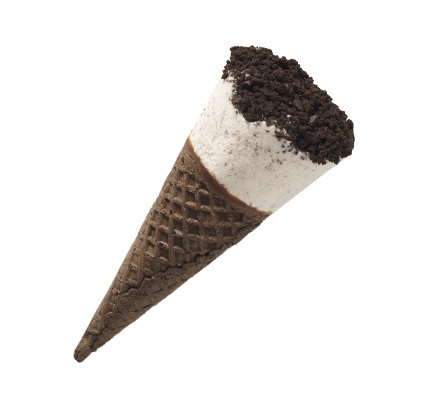 Perfect size cookies & cream low fat ice cream in a chocolate sugar cone dipped in chocolate flavored coating topped with chocolate cookie pieces. Case Dimensions: 12.25 in. x 12.1875 in. x 5.875 in. Ingredients: Skim Milk, Sugar, Corn Syrup, Bleached Wheat Flour, Whey, Milk, Wheat Flour, Contains 2% or less of Unsweetened Chocolate, Cocoa, Cocoa Butter, Cocoa Processed With Alkali, Natural Flavors, Enriched Wheat Flour (Wheat Flour, Niacin, Reduced Iron, Thiamin, Riboflavin, Folic Acid), Canola Oil, Food Starch-Modified, Soy Lecithin, Oat Fiber, Salt, Coconut Oil, Maltodextrin, Palm Oil, Soybean Oil, Baking Soda, Corn Starch, Mono & Diglycerides, Carob Bean Gum, Cellulose Gum, Carrageenan, Caramel Color, Vitamin A Palmitate. Allergen Information: Contains Milk, Soy, Wheat. May contain Peanuts.